I did a thing. Randomly on a whim. I really didn't think this one through. I did just enough thinking to make sure I had a clean paintbrush and a stir stick. 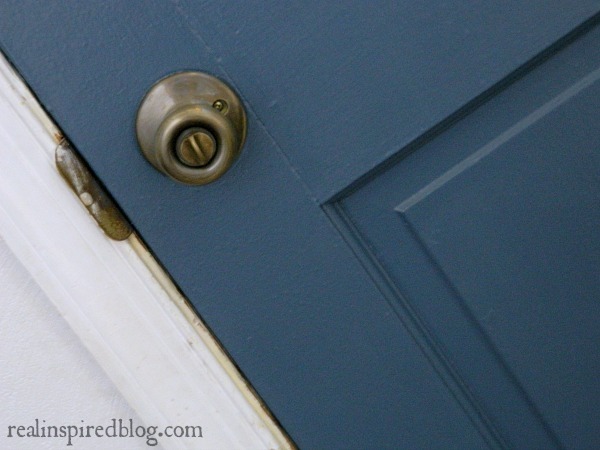 I painted the inside of our front door. I have been really bored with the hallway and up the stairs. 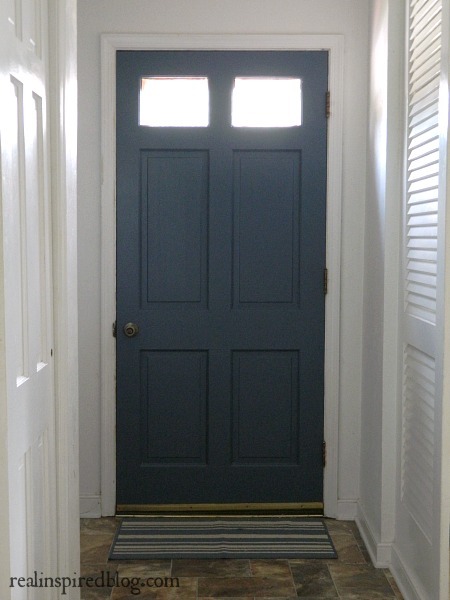 As I was pondering how to remedy the situation, I remembered that colored door trend that I had wanted to try someday. Why not now? The whole hallway needs new paint anyway, what's the worst that can happen? You know, besides Hubby coming home from work to find me covered in paint, aggravated that I painted something instead of putting the laundry away? Here we have the before and after, my friends! I happened to have almost a full gallon of navy blue paint leftover from painting the back of the shelves in the nursery. The color is Mountain River by Valspar. It's a slightly grayed out true navy. I had a slight heart attack after the first coat went on. You know those moments where it hits you what you just did? It looked pretty bad with all the white showing through. But it could only get better! I ended up putting three coats of paint inside the panels and two coats overall. I love it. The way the light comes through those top windows...LOVE. IT. It's a dramatic change without being too dramatic. Casual dramatic? It makes a statement and brings some color to our boring hallway. But there are more plans in the works. I'm not stopping here! This is where I could use your opinions. This area is badly in need of a fresh coat of paint. What color would you put on the walls? I'm leaning towards really light gray or white. What do you think? 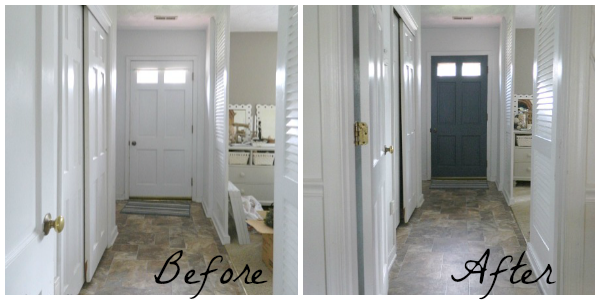 Would you ever consider painting an interior door?